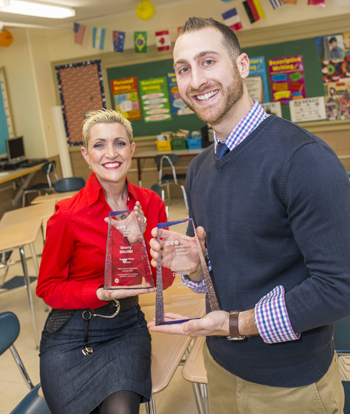 Sherry Mitchell and Matt DiGioia, teachers at Harry M. Bailey Middle School in West Haven, Connecticut, are the second place winners of the HMH Curious Classroom Contest. This post summarizes both Sherry and Matt’s reflections about their passion for teaching, as well as their involvement with the HMH Curious Classroom Contest and the HMH Marketplace. What inspired you to become teachers? Matt DiGioia (MD): When I was a freshman in high school, I had an incredible English teacher who had a way of forming strong relationships with his students. He really connected to students on a personal level by getting to know their personal interests and learning styles and his class allowed me so much freedom to write about whatever interests I chose. He made writing fun and unique. I don’t remember specific lessons he taught us, but I will always remember his enthusiasm, kindness, and passion for the subject. From then on, I was set on doing the same. Sherry Mitchell (SM): When I was in eighth grade, I had a math teacher who made learning math very difficult. Instead of building students up, he would break students down. I also, however, had incredible teachers along the way, all whom I remember vividly and am grateful for. I soon came to realize that teaching is one of the most powerful professions on the planet. I became very passionate about being a teacher and empowering students to be the best they can be and help them discover how brilliant they truly are. 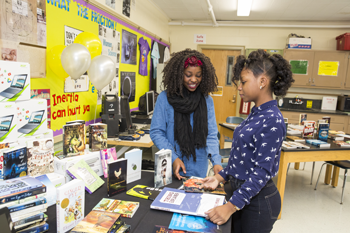 What did your involvement with the HMH Curious Classroom Contest mean to the both of you? MD: The HMH Curious Classroom contest provided us with a unique experience to start creating lessons that students could take from classroom to classroom and provide them with a unique learning experience. Interdisciplinary education can foster a student’s ability to recognize the interactions between subject areas. SM: When Matt and I decided to enter the HMH Curious Classroom Contest, we knew that this was the perfect opportunity to “break the mold” and design lessons that promoted interdisciplinary learning. We must prepare our students for today’s workforce in which critical thinking and problem solving surpasses memorization of facts. This allows for an understanding of real world phenomena and encourages students to value their learning. The excitement that we had in working collaboratively on the HMH Curious Classroom lessons rubbed off on our students in a very positive way. What inspired you to make The Martian such an important component of your joint teaching resource? MD: The Martian is a realistic science fiction novel about an astronaut who is mistakenly left on Mars after a bad accident. After reading The Martian, I immediately saw what potential it had if shared in the classroom. The protagonist, Mark Watney, had a great sense of humor that readers can easily relate to. His actions and way of dealing with difficult situations keep readers captivated and invested in the novel. The book is loaded with science, history, and math components so it made sense to create a whole set of lessons around the novel. SM: A year ago, Matt recommended I read The Martian. He assured me that I would love it due to the science references throughout. I appreciated how science was effortlessly included in the novel and how the main character, Mark Watney, used his science knowledge to survive. We saw the strong potential this novel had for use in the classrooms. I was excited to present a story to my students that enables them to become excited about learning science. How do you think teachers will benefit from sharing resources with one another? SM: Teachers by nature are resourceful and creative. It is our hope that the resources we share in the HMH Marketplace will help make interdisciplinary instruction easily accessible for all educators, enhancing the experiences that they provide to their students. We design lessons to engage students, and differentiate instruction to ensure that all students have the opportunity to learn. Our goal is to make this easy to do for all teachers at every level and encourage educators to go beyond a subject area to address education holistically, a task that could otherwise seem daunting. We are hoping these resources will inspire teachers to continuously promote curiosity in the classroom.